This disc is a powerful and intense rendition of some of the greatest of the 20th century flute literature, with a sprinkling of solo Bach and a Wild Riot. 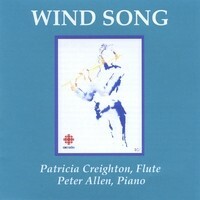 Recorded by CBC Radio live, the concert was so good that the producer encouraged Patricia Creighton to lease back the rights to make a CD. Part of it's charm is that it is live and unedited. The accuracy is stunning and the ensemble interplay with her powerful pianist Peter Allen is fantastic.